Last week temperatures ranged from 6-8 degrees above normal. Precipitation ranged from a ¼ inch to 3 inches. Base 50 growing degree-days ranged from 50 to 130. Today will start foggy then turn sunny with above-normal temperatures in the mid 70’s to mid 80’s. Overnight lows will be in the mid 50’s to mid 60’s. A weak cold front will bring scattered showers overnight, most likely in northern areas. Friday isolated, scattered showers and thunderstorms will move through with the front. Highs will range from the mid 60’s to upper 70’s. Lows will be in the mid 40’s to mid 50’s. Saturday temperatures will be noticeably cooler behind the front, in the 50’s and 60’s. Overnight temperatures will be in the mid 30’s to 40’s with frost possible. Sunday highs will be in the mid 50’s to 60’s. Overnight temperatures will be in the mid 30’s to low 40’s with frost possible. Monday highs will be in the mid 50’s and 60’s. Lows will be in the 40’s and low 50’s with rain possible. Tuesday temperatures will be in the upper 50’s to around 70 with a chance of rain. Lows will be in the 40’s and low 50’s. Wednesday temperatures will be in the 60’s to around 70. Lows will be in the 40’s and low 50’s. The five-day precipitation amounts will range from a trace to 1 ½” , with the highest amounts in northern NY. The 8-14 day outlook (September 29 – October 5) shows increased chances for above-normal temperatures and below-normal precipitation. The Drought Monitor: Rainfall associated with frontal passages prompted a 1-category improvement across southern Cattaraugus County in southwestern New York state, which shows up on the Advanced Hydrologic Prediction System (AHPS) 7-day observed precipitation map as southwest to northeast-oriented swaths of heavier rain. 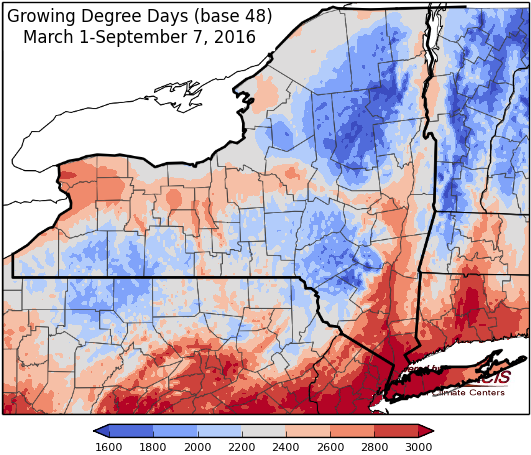 In the Lower Hudson Valley of southeastern New York, which missed out on recent rainfall, moderate drought (D1) was expanded across Dutchess and Putnam Counties. 4 Pest Records help with the future! Last week temperatures ranged from 6-8 degrees above normal. Precipitation ranged from a trace to 2 inches for most areas, isolated areas of 2 to 4 inches. Base 50 growing degree-days ranged from 90 to 170. Monday highs will be in the 70’s with isolated showers and thunderstorms possible. Lows will be in the 50’s. Tuesday dry weather will return with temperatures in the 80’s. Lows will be in the mid 50’s to low 60’s. Wednesday temperatures will be in the 80’s, with a slight chance of showers. Lows will be in the mid to upper 50’s. The five-day precipitation amounts will range from ½” to 1 ½” , falling Sat- Sun. The 8-14 day outlook (September 22-28) shows increased chances for above-normal temperatures for all of the state and above-normal precipitation for all but part of the Catskills and Hudson Valley Region. 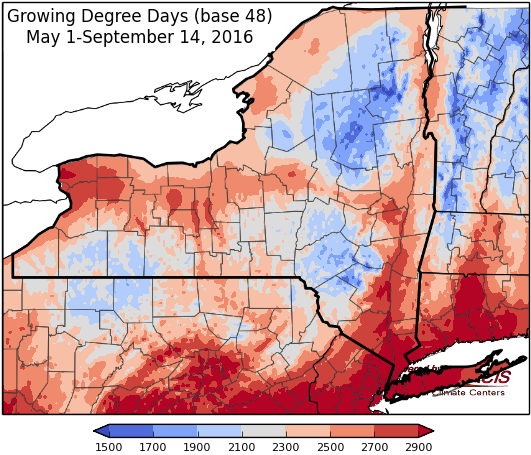 The Drought Monitor: Despite the heat and dryness, heavy downpours (locally more than 2 inches) led to some drought reduction in southwestern New York and Jefferson County. D1/Moderate Drought expanded in the Adirondacks, Lake Champlain, and Hudson Valley regions. Last week temperatures ranged from 2 degrees below normal to 4 degrees above normal. Precipitation ranged from a trace to 1 inch for most areas, isolated areas of 1 to 2 inches. Base 50 growing degree-days ranged from 70 to 130. Today will be hot and humid with scattered afternoon and evening showers and thunderstorms ahead of a week cold front. Areas in central NY will see gusty winds and isolated severe storms. Temperatures will be in the mid 80’s to near 90. Overnight lows will be in the mid to upper 60’s. Friday will be sunny, less humid, and slightly cooler with highs in the upper 70’s to mid 80’s. 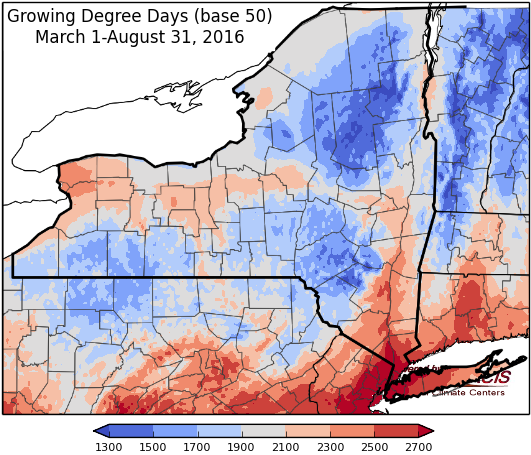 Areas in eastern NY will still approach 90. Lows will be in the mid 50’s to low 60’s, with a few showers possible in western NY. Saturday temperatures will heat up again to the mid to upper 80’s with scattered showers and thunderstorms possible. Possibility exists for some severe storms and windy conditions. Overnight temperatures will be in the 60’s. Sunday high pressure dries things out after a few lingering showers in the morning, highs will be in the 70’s. Overnight temperatures will be in the 40’s and low 50’s. Monday highs will be in the 70’s. Lows will be in the upper 40’s to mid 50’s. Tuesday temperatures will be in the mid 70’s to mid 80. Lows will be in the upper 40’s to mid 50’s. Wednesday temperatures will be in the 70’s with a chance for precipitation. Lows will be in the mid 50’s to low 60’s. The five-day precipitation amounts will range from a ¼” to ½” in eastern NY, and ½” to 1 ½” in the rest of the state. The 8-14 day outlook (September 8-14) shows increased chances for above-normal temperatures and below-normal precipitation for all of the state. The Drought Monitor: On this week’s map, short-term precipitation deficits (30–60 day), low streamflows, and dry soils led to the expansion of areas of Extreme Drought (D3) in the Finger Lakes District of New York. 4 What is on Your Corn Ears! Last week temperatures ranged from 2 to 8 degrees above normal. Precipitation ranged from 1/10 inch to 2 inches. 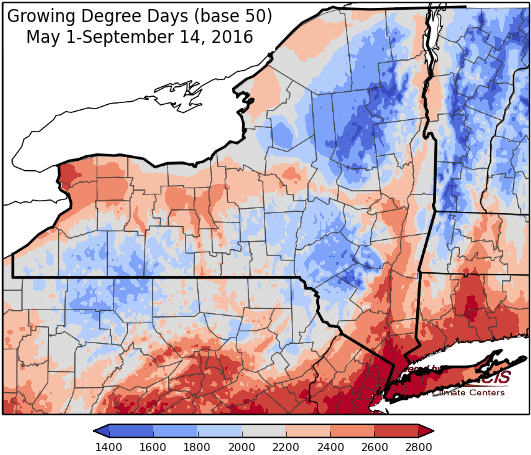 Base 50 growing degree-days ranged from 90 to 170. Today will be cool behind the cold front, with a few lingering showers in eastern NY. Temperatures will be in the upper 60’s to mid 70’s, warming to low 80’s in eastern NY. Overnight lows will be in the 50’s and low 60’s, 40’s in northern areas. Friday will be sunny with highs in the upper 60’s and 70’s. Lows will be in the mid 40’s to upper 50’s. Saturday temperatures will be in the mid 60’s to 70’s again with sunny conditions. Overnight temperatures will be in the mid 40’s to 50’s. Sunday highs will be in the mid 70’s to low 80’s. Overnight temperatures will be in the 50’s. Moisture from Tropical Storm Hermine (will then be post tropical) will bring rain, possibly heavy, for southeastern NY. Monday highs will range from the mid 70’s to mid 80’s. Lows will be in the 50’s to low 60’s. Tuesday temperatures will be in the mid 70’s to a few 90’s possible. Lows will be in the mid 50’s to low 60’s. Wednesday temperatures will be in the 80’s, with isolated 90’s possible again. Showers and thunderstorms are possible, along with increasing humidity. Lows will be in the 60’s. The five-day precipitation amounts will range from a trace to 1” in southeastern NY, the rest of the state will be dry. The 8-14 day outlook (September 8-14) shows increased chances for above normal temperatures and above normal precipitation for all of the state. The September outlook shows increased chances for above normal temperatures and no indication for precipitation for most of the state.. The Drought Monitor: Overall the Northeast was drier than normal for the USDM period. The rain event that occurred during the first part of the USDM week dropped 1.5 inches at the Buffalo airport and over an inch at several nearby co-op stations. Although the long-term factors (such as groundwater) are low but stable, near term factors such as creek flows have recovered considerably and it was reported that lawns and foliage have greened up in the Buffalo metro area. This resulted in D3 being trimmed back in the area. D2, severe drought, expanded to cover most of Jefferson County. St Lawrence, Franklin, and part of Clinton counties are now in D1, moderate drought.